It didn’t take long. After yesterday’s good news in the trial of Dutch journalist Fréderike Geerdink, in which the prosecutor moved for acquittal, came news from Istanbul that another prosecutor was asking for 4.5 years each for journalists Ceyda Karan and Hikmet Cetinkaya for their republication of a cover image of the Prophet Muhammad from Charlie Hebdo. “We are being threatened with prison for defending free speech,” Karan told Reuters. “To threaten a journalist because he or she printed a drawing that does not include an insult can only come from a religious, authoritarian government. “Neither of us will abandon our defense of free speech,” she said, adding she has had bodyguard protection since January. 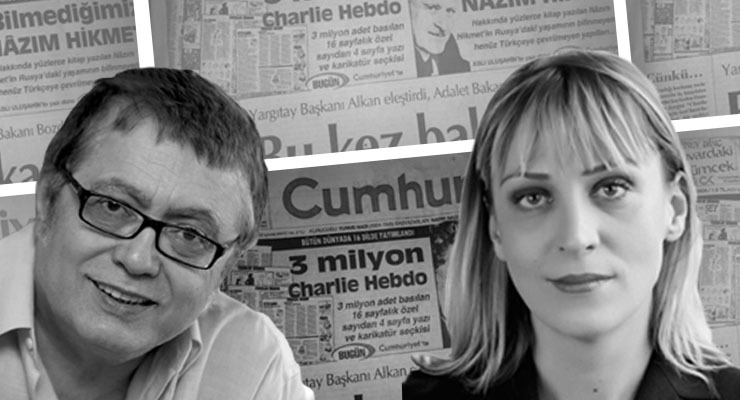 The prosecutor opened his investigation into Cumhuriyet after Turkish Prime Minister Ahmet Davutoglu accused the paper of “incitement” for publishing the Charlie Hebdo excerpts. As Amnesty’s Turkey researcher, Andrew Gardner noted on twitter, the political context of this prosecution is clear, with both the Prime Minister and the President condemning the publication of the images. There is a long history of Turkish courts treating criticism as “insult”, resulting in criminal convictions which violate the right to freedom of expression. Criminal defamation laws are frequently used in this regard, but any complaints of defamation or insult against individuals should be resolved through civil, not criminal, litigation. There is in particular a growing trend to prosecute expression which is deemed to insult Islam. In one case from 2013, pianist Fazil Say was convicted for “denigrating Islam” under a law prohibiting “incitement to hatred or hostility”. Under international human rights law, protection of religious or other beliefs or the sensibilities of believers is not a permissible ground under international human rights law for restricting freedom of expression, and “denigration” of a religion does not amount to incitement to hatred. This prosecution represents yet another attempt by Turkish authorities to stifle public discourse and limit press freedoms. These prosecutions fly in the face of international norms and international law; nonetheless they are intensifying. The prosecution of Cetinkaya and Karan represents another step in this process. Sadly, it is unlikely to be the last. This entry was posted in Amnesty International, Freedom of COnscience, Freedom of Expression, Press Freedom, Turkey and tagged Amnesty International, Andrew Gardner, Ceyda Karan, Charlie Hebdo, Defamation, Freedom of Expression, Freedom of the Press, Hikmet Centinkaya, Press Freedom, Turkey. Bookmark the permalink.